That's pretty slick. How do you control volume? Just turn the bezel? Shogyo #3650VC. Solid-state audio indicator emits a medium-loud, high-pitched tone. Screwdriver adjustable trimmer on back of device controls volume. Operates on 4-28 Vdc @ 6 mA. Black plastic face is 1.45" diameter x 0.16" thick. 1.25" diameter threaded mounting bushing with large plastic nut mounts in panels up to 0.5" thick. 0.187" qc or solder terminals. Sorry, for the photo quality since it doesn't show the trimmer clearly. It's located between the terminals. There is no space behind that knee pad for that. I checked my knee pad on the left side and there is little space behind the knee pad. so how did you put all those switches behind that because there is just metal behind there. Got all the bits and parts to do this with my GT. So, want to double check a couple of things. 1. When I install the cigarette outlet - I can then safely use my Battery Tender by plugging it in there instead of monkeying with the battery, right? Kim, This is a perfectly safe (and very convenient) way to connect a battery tender. Much better I think than through a dedicated pigtail on the battery. Just make sure you have the polarity right - there are a few previous posts on this thread that deal with that. 2.2 amps is a safe load (I'm assuming that's the load for two gloves); even 4.4 amps would be ok. You should be able to draw close to 10 amps from the plug, installed at the alarm connector. If you install the outlet connected directly to the battery you will be able to plug in your tender and then charge the battery. Your #16 wire will handle a amperage of 5 amps, so thats safe for the gloves. These values are for single conductors in free air, so you'd de-rate a bit for the bundled wires in the bike. The wire on the alarm connector circuits is 1.0 sq. mm, which is approx. AWG 17. Splitting the difference between AWG 16 and 18, 1.0 sq. mm wire should be good to about 15A at 60°C (the most conservative rating). De-rating for bundled wire would take it down to about 10A. That's exactly the current at which these circuits are fused. So my next question is fueled by the possibilities of the lighter plug and all the different threads about jump-starting scooters, etc. 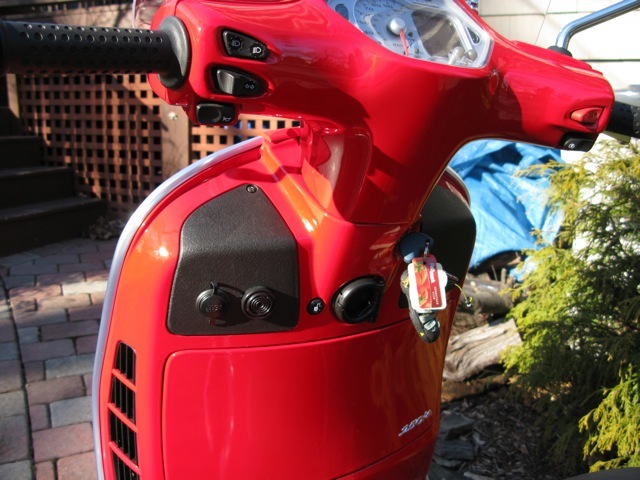 Would it be possible/safe/advisable to make a lighter outlet to lighter outlet cord to jump start the scoot from a car? I know for cars it isn't enough to jump start through that type of connection. Would it be enough to jump start a GT? I've seen some premade ones for sale, or some pretty simple instructions for making your own. Would seem like a good thing to have under the seat for the cold weather days I'm seeing now. The lighter plug, supplied by the alarm connector as I've got it here, would not be a good way to jump start, in either direction. The alarm connector circuits are fused at 10A, and jump-starting has the potential to draw way more than that, depending on the remaining charge in the depleted battery. If you want the capacity to do that, you'd do best to feed the lighter plug from a heavier wire connected directly to the battery's positive terminal. Re: There is no space behind that knee pad for that. I mounted all the switches, LED and cigar lighter on the metal behind the plastic knee panel. Then I drilled holes through the plastic knee panel to allow the switches etc to stick through the knee panel. 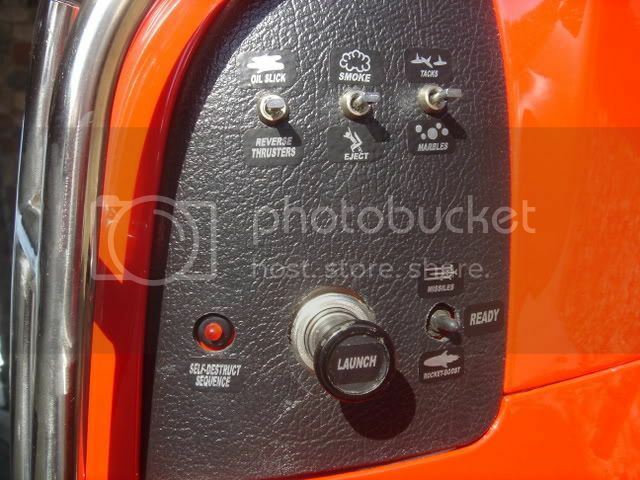 If you look closely at the pictures, you won't see any nuts holding the switches to the knee panel. The nuts are hidden behind the knee panel. The the Right knee panel really does have MI-6 stuff. I have now labeled some of the MI-6 functions on my ET4. I like the modifications to the original project very much, but have a question about the basic bit. I'm having a hard time getting the wires to stay in the connector firmly enough to then be able to strap the wires to the side of it and thus securing them. I did point them a bit with solder, but it still seems to be hit or miss. As such, I'm concerned that the connection even after I get it secured may not be that good. ANy tips out there? It sounds like the wire you're using is too fine. I used #20AWG stranded copper. I stripped about ¼" of insulation, and tinned the stripped ends with solder. It helped to slightly mash the tinned ends with a needlenose before inserting into the connector. I think I used wire wrap wire for my connections to the garage door remote to the Alco switches. Tinning the wire prior to soldering is key. I haven't had any wire breakage in over 6 years of service. I've attached a pic of my install also. 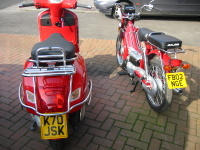 Vespa GTS 250.. Zundapp Bella R201..Royal Enfield Classic. 500. Thanks Cincinnati John... Did the mod today.. top info. Jim. Great write up, great questions, great thread! Thank you. It answered my switched power question of today. What I don't understand is the battery tender>INlet plug cable. What is it designed for? Where do you plug it into? Aren't these plugs designed to go INTO a power OUTlet, so wouldn't it make sense to wire an outlet to that battery tender cable (which is one of my next projects)? Same question goes to Exonic Jay's picture with this plug connected to the battery tender and inserted to a power outlet. So, the battery power is fed into an outlet, which is connected to that same battery? Appears to be a circuit with no function, or what am I not seeing? Moped, sorry I didn't see your post until just now; I'd have answered sooner. The receptacle can function either as an inlet or an outlet. There's a direct path between it and the battery, so you can charge the battery through it or draw power from the battery through it, either way. A wire's a wire, y'know? To connect a tender, you'd put a mating plug on the outlet of the tender, and plug into the receptacle. Works slick. Has anyone found an all in one solution? Buzzer or clicker in housing with diodes and three wires coming out? BTW - what is the third set of wires in the GT200 left knee well? Recognize alarm cluster, power plug. Props on the MI-6 labels. Definitely takes it to a whole new level. I couldn't do better myself. Very good; glad to hear that. Do feel free to give the OP a , y'all! thanks for the wiring diagram. finally complete the project last weekend. was thinking of wiring up a small 300watt amp to 110watt speakers in the toolbox and playing my i-pod through it IS THIS POSSIBLE JOHN ? I would say the alarm connector circuits are not heavy enough for that application. 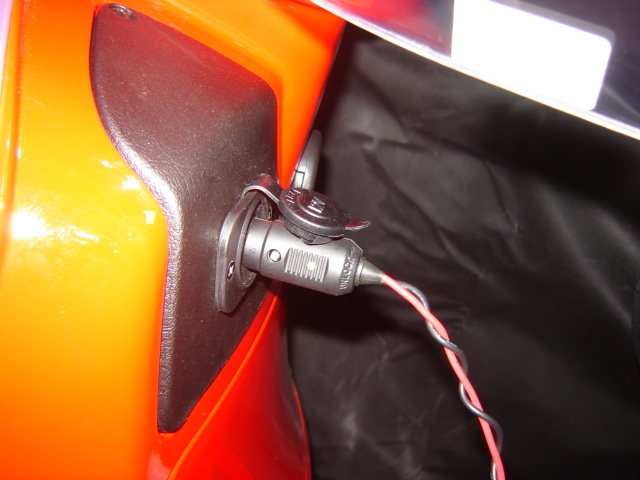 The alarm connector will pass 10 amps safely, and the amp will draw more than that during peak signals (300 watts peak ÷ 12 volts = 25 amps peak; more than that actually, considering amp efficiency). You might be able to get by, by running a dedicated circuit directly from the battery, but you'd first have to know the steady-state no-signal current draw for your amplifier. If that current is anywhere close to 8 amps, the amp would be too much of a load on the electrical system. The alternator only has enough excess capacity to deliver about 8 amps continuous for accessories. It is ok to draw more than 8 amps, but only on an intermittent basis. Any excess over 8 amps would be drawn from the battery (which would have to be made up by the alternator, of course, during lower-load times). Oh, and welcome to MV. Glad you made your first post here! It could work I suppose, but that's running a bit close to the edge for my comfort level. Perfect for motorcycles or cars, high power from a small size. I decided to start this up today and took the left knee panel off on my 300 only to find almost nothing there. Any ideas where the alarm connector would be? I looked in every manual and forum post I could find, but no dice. I have the early wiring harness in my '07. Does anyone know what the extra open connectors are bundled with the alarm connector?